...and a lot of other stuff, too! Ok, so the most amazing and wonderful thing happened to me last Saturday. Actually, the story is a bit longer than that. Back in March, I was finally fitted with my new motorized wheelchair. My last one had been my main mode of transport for the last 9 years, so the new one took some getting used to. Specifically, it has this fun little thing on the side which I can only describe as the wheelchair equivalent of a glove compartment, very handy for carrying things such as the cell phone and van keys. Not so great, it turns out, for MP3 players. I had been the owner of a Creative Jukebox Zen Xtra, the big one with the mondo 60GB hard drive. I love music and literally own hundreds of CD’s, and this early model large hard drive device had been my constant companion for the last three years or so. And no, I’m not exaggerating… I have big ol’ speakers to plug into it at home, really cool speakers on and under my desk at work, and a car adapter, so really, my music is absolutely everywhere with me. On my first day home alone with my new chair, I clipped the doorway with the glove compartment thingy, which renders my total width almost two inches wider than I had been used to for 9 years. My MP3 player bounced out, and crashed to the floor, and broke. I mean really, how was this possible? I’d dropped it lots of times before, even on the concrete pool deck at the swim club, with no ill effect. To say I was heartbroken was putting it mildly. For the last several weeks I had been making do with an SD card in my PDA (yep, I’m a gadget geek! ), but even with the 2GB card, it just wasn’t the same! I wanted all of my music at my fingertips, and I missed it terribly. Well, last week, my very good friend Steve (he has to be a good friend to take me to the Sheep and Wool Festival, right?) came into the house carrying a gift bag. This is such a rare thing to happen that at first I actually assumed that his sister Cindy had sent a little something from Illinois! Oh boy. Was I ever surprised when I opened the gifts and found a brand new 80GB iPod Video! I was beyond flabergasted and completely overjoyed. Yes, the gift was extravagant to the point that I truly did not know what to say. 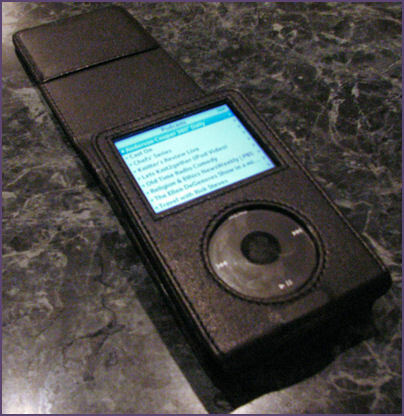 But, more than that, m friend truly understood what my MP3 player had meant to me and how much it had played a role in my day-to-day life. My friend Steve is someone who would be there for me, no matter what. He has given so much of himself over the years, and is a true support to me and my family. So yes, I am overwhelmed. He really “got it.” And now, I am happily re-loading my music library and my practically every waking moment is once again filled with music. So Where’s the Knitting Connection? I’ve discovered Podcasts! Wow, they’re fun. 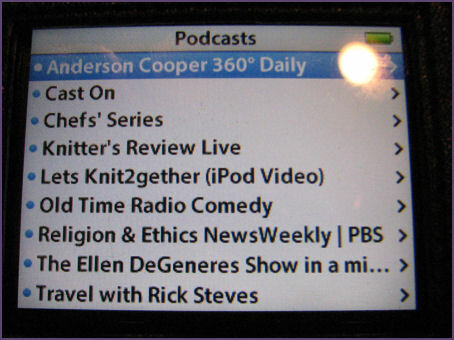 There are quite a few knitting podcasts listed on iTunes. Right now, my favorite is Cast On, by Brenda Dayne. I also really love Let’s Knit2gether, which is a really cool video podcast. And the best part about podcasts? They’re totally FREE! Where have these BEEN all my life? As you can see in the photo, I can get my daily nerdy news fix, fulfill my travel fantasies, and catch a few laughs and other stuff, too. I think I am addicted to these podcasts, and I currently have more than 80 different episodes of various ones to view and listen to. They’ll keep me busy, for sure. Haha. Thank you so much, Steve!! Today I stopped by Barnes and Noble and picked up three new knitting magazines: Interweave Knits, Creative Knitting, and Knit Today, which I had actually not seen before but was intrigued. It was bundled with a booklet that had a bunch of patterns for bags in it, so I figured it was worth a look. Haven’t checked it out yet, but when I do, I’ll let you know. And I am actully considering subscribing to Interweave Knits, because I’m curious to see how Eunny Jang is going to do as their new editor. To be honest, I had never even heard of her before the discussion about her kicked up after the Interweave Knits announcement. The Old Guard wondering what a hip young thing of 24 can do with the magazine. Lots of others saying that she is a brilliant writer and knitter. I have since discovered the latter to be true myself, but as a writer and editor by profession, I cannot imagine having that amount of responsibility on my shoulders at such a young age. Heck, I couldn’t imagine it now. But I am rooting for her and I want her to do well. So, I am anxious to see her debut issue when it comes out in the fall. Well, this picture definitely shows why I absolutely hate photographing pink! The red in the pink really throws my camera off, and even when trying to correct in my photo program (Corel Paint Shop Pro XI), it still looks yucky and not quite right. But hey, you can see that in the last two weeks my little strip of a blankie about doubled in size. I have a looooong way to go! I am now wondering whether I can actually get it done in time for the recipient’s baby to be born. It’s a good thing that I have a 14-hour (each way) car ride coming up in August when we head to Florida. I sure hope that helps. I’m still enjoying the knitting, and I’m not bored yet, which is a good thing. Hopefully I can stick this one out to the end. I wish though, that I had done this with slightly larger needles… the teeny stitches are part of what is making this project take forever. Still, I think this blanket is going to be fun when it’s done. Maryland Sheep and Wool Festival is only a week away! Can anybody say “Yay!” with me? So here it is, the first photo of my rainbow baby blanket in progress. I’ve been working steadily now for about two weeks. I guess this is going to take a while! I’m on the fourth color, which will be a 10-row stripe. The next color will be a sort of aqua shade, and it will be 8 rows. If you’d like to see a description of my method for this project, go to the April 5 entry. Of course, the one bad thing about having a long ongoing project but loving to blog is that it will be harder to update frequently without driving people nuts with pics of the same old, same old thing. So, I’m guessing I’ll have to be sure to add more about cool knitting stuff, including new products and books and other fun stuff I find when I’m out and about in the world of knitting. Hopefully I’ll be able to update often enough to keep everybody from being bored to tears. I’m ready! I’m ready! Egad, I sound like Spongebob! Too much time watching kid shows this week during Spring Break, I guess! 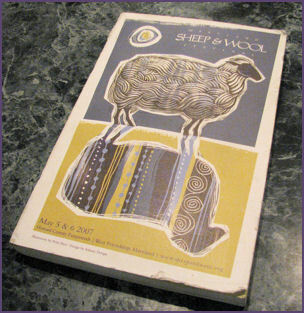 But hey, my Maryland Sheep and Wool Festival catalog finally came the other day, and I’m psyched! I look forward to this event all year. Ok, so I admit it’s overcrowded. And I can’t get around everywhere in my wheelchair. And there’s no way I could ever see everything in just one day. But, the sights! All those lovely yarns, in any type of fiber you could possibly imagine. The colors! The amazing hand painted creations! wow. And the sounds! Ah, the sounds of sweet mountain music, of the sort that one would expect from a festival with a truly down-home air about it. And the smells! Oh my gosh, it might sound crazy, but the lamb kabobs are delicious! And the fresh sqeezed lemonade. I’ll have to remember to bring the wet wipes, in case my hands get sticky. There will still be a zillion yarn stalls to visit after lunch. And the animals… I love the baby lambs. Ok, so I ate lamb for lunch. But the babies are so sweet and cute I would love to take one home with me. But, my suburban sensibilities know that the Sheep and Wool Festival is fantasy land, and I don’t really live in the country. Back down to Earth. This year’s festival is May 5 and 6 at the Howard County Fairgrounds. I’m hoping to get a group together of people from the KnitTalk Yahoo Group. Hopefully, lots of people will be there to meet and greet this year. So far, we’re planning to hook up at Noon on the 5th, place to be determined. Of course, it’s still several weeks away, so everything is subject to change. Watch this space for updates! So where have I been, you ask? Well, let me tell you, it’s been quite a month in my little knitting world. I’ve been working on a baby blanket idea for my good friend from work who is expecting. At first I thought I would try an Aran Sampler afghan, where every square displayed a different pattern. In typical fashion for me though, this became quickly overwhelming. Trying to figure out which pattern to do next and how to knit it up so it would mirror the size and shape of the other squares, was just making my brain hurt.Then I became focused on how much I hate fiinishing, and the thought of sewing up all of those strips of squares and weaving in all of the little ends that they would produce was not exciting me at all. So I decided that horizonal stripes would be the thing. And with my love of cables, I was determined to incorporate some kind of cabled pattern into the blanket. But you know what? With the vivid colors and the stripes, the cables just became TOO MUCH. So that idea went by the wayside, too. Then I tried the Lizard Ridge pattern from Knitty.com. This pattern is truly great and I do think I will make one someday, but I need to practice my techniques further because some of the stitches on my short rows were icky looking. I think maybe there were times when I forgot to pick up the wrap with the wrapped stitch on the short rows. Plus I didn’t like that it was basically a stockinette pattern, and since I am using an acrylic yarn it won’t block well. So getting it to have the shape I wanted would be more challenging than I thought it was worth. I certainly see why the designer chose wool yarns with long color runs to do this pattern. It is well suited for that. 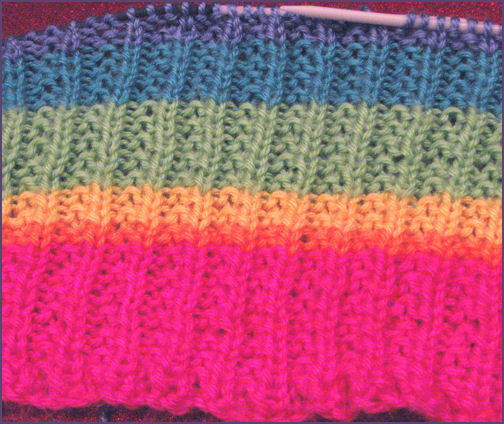 Then it occurred to me… a simple stitch pattern with almost random stripes? But what stripe pattern to use? That’s when I remembered reading another pattern on Knitty.com, Tiptoe Through the Tulips, by Stephanie Pearl-McPhee. 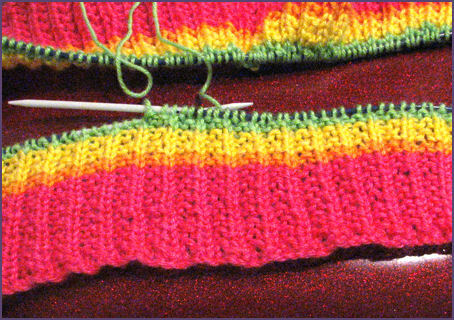 In this pattern, Stephanie describes how she created a seemingly random stripe pattern by having a certain number of colors, and a different number of stripe widths. So, each time a color came up in order, it would be a different width, because the widths occur at a different rate. 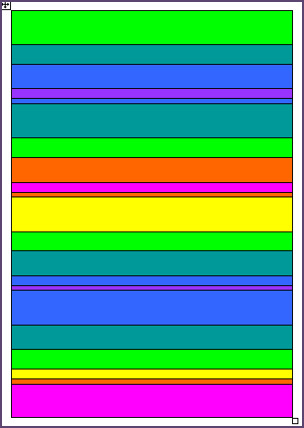 So, if I have seven colors, and five different widths of stripes, and the colors repeat x often and the widths repeat y often, I’ll get lots and lots of unique looking stripes. The picture in this entry sort of represents this. Stephanie also includes a table in her pattern that shows how this works, so i won’t try to re-create that here. So I’m doing seven colors (pink, orange, yellow, green, teal, blue, purple) and five stripe widths (14 rows, 2 rows, 4, 10, 8) So, in combination, these rows of colors of varying widths are very striking. At least in my mind. That’s pretty much where this project is right now. I have started it, but I’m still knitting the first color! So I guess I’ll post pics when there’s enough color going on so I can show it off. I’m doing the whole thing in a simple mistake rib pattern (K2, P1 every row), which is very simple and a far cry from the design I started with. But, I guess, sometimes simplest is best. I’m finally enjoying this project.